Mary, Our Mother, Pray for Us. A Pilgrimage to the Marian Shrines in Europe. 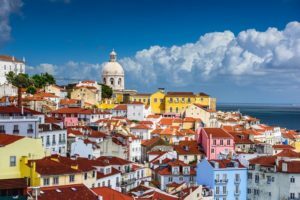 We begin our pilgrimage today as we depart the USA and make our way to Lisbon, Portugal. Dinner and beverages are served in flight. We arrive in Lisbon and are met by our Pathfinders representative who takes us to our motor coach. We enjoy a panoramic tour of the city, including a stop at St. Jerome’s Monastery before making our way to St. Anthony’s Church, the site of the birthplace of St. Anthony of Padua. We then arrive to our hotel and enjoy our welcome dinner. Dinner and overnight in Lisbon. We begin our pilgrimage today as we travel to Santarem and visit the Church of St. Stephen, which contains a Eucharistic Miracle from the 13th century. We then head to Fatima where we will visit the Hamlet of Aljustrel, the home of the shepherd children, along with the Parish Church. Dinner and Overnight in Fatima. Today our pilgrimage is full of prayer and reflection with our Blessed Mother Mary as we explore the site of her apparition to Lucia, Jacinta, and Francisco. We begin at the Little Chapel of the Apparitions, site of the first appearance on May 13, 1917. We continue on to the Basilica of Our Lady of the Rosary and to visit the museum. In the afternoon we pray our way along the Via Sacra, The “Sacred Way”, marking the path taken by Lucia, Jacinta and Francisco to the first apparition. 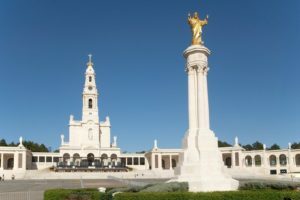 We then visit Valinhos, the site of Our Lady’s August 1917 apparition and conclude our day with private devotions and a candlelight procession. Dinner and overnight in Fatima. Our pilgrimage today takes us to “The Golden City,” Salamanca. We enjoy a walking tour including the Salamanca Cathedrals, the Plaza Mayor, the University of Salamanca (oldest University in Spain and 3rd oldest in Europe), and many other beautiful churches and city highlights. Dinner and overnight in Salamanca. Today our pilgrimage takes us in the footsteps of the beloved St. Teresa of Avila. We begin by visiting Alba de Tormes, home of the Carmelite Monastery she founded, and her final resting place. 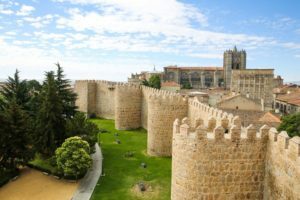 We visit the museum dedicated to her and enjoy some time at leisure before continuing on to Avila and the perfectly preserved eleventh-century walls that surround the old city. We spend our time in Avila visiting the Cathedral de Avila, La Basilica de San Vicente, Incarnation Convent (where St. Teresa professed her vows,) and El Convento de Santa Teresa (the home of St. Teresa.). We then make our way to Burgos. Following dinner this evening is at leisure. Dinner and overnight in Burgos. As our pilgrimage continues on to Lourdes, we stop in Loyola, the birthplace of St. Ignatius of Loyola, founder of the Jesuits. We visit the Holy House, the birthplace of St. Ignatius, including the Basilica dedicated to him. Upon arrival in Lourdes, we settle into our hotel and enjoy dinner before participating in the candlelight service. 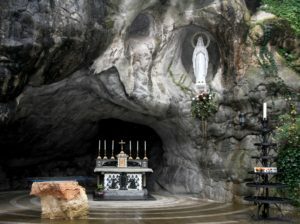 Our pilgrimage today includes a day full of prayer and reflection with our Blessed Mother Mary as we visit the site were St. Bernadette had her 18 visions of Mary. We begin at the Grotto of Massabielle, the site of her visions and the spring she discovered. We continue on to the home where she and her family lived as well as their parish church. We then participate in the Procession of the Blessed Sacrament and the Blessing of the sick. After dinner, we attend the Torchlight Procession and Rosary. Dinner and overnight in Lourdes. This morning we depart Lourdes and board a morning train to Paris. Upon arrival we visit the Sacre Coeur Basilica, dedicated to the Sacred Heart of Jesus. 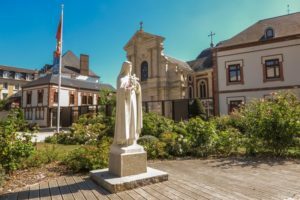 We continue our pilgrimage to Lisieux, where we walk in the footsteps of the beloved St. Therese of Lisieux. Dinner and overnight in Lisieux. Today our pilgrimage begins at the Basilica of St. Therese. We then make our way to Les Buissonets, her family home which contains relics of the Saint and to the Carmelite Convent she entered in 1888 and is her final resting place. This afternoon our pilgrimage walks in the footsteps of our troops as we visit the Normandy Beaches Landing, site of the allied invasion of Normandy on June 6, 1944 during World War II (D-Day). We conclude our day by visiting the Normandy American Cemetery and Memorial, honoring the American soldiers who died in Europe. Dinner and overnight in Lisieux. Our pilgrimage today takes us to Chartres and the Cathedral of Notre Dame. After time for reflection and leisure we continue our journey to Paris. Dinner and overnight in Paris. Today our pilgrimage begins at the Shrine or Our Lady of the Miraculous Medal. We then continue on to Saint Vincent de Paul Church and the Notre Dame Cathedral. We then take a panoramic tour of the city where we see the Eiffel Tour, L’Arch de Triomphe and Champ-Elysees. Dinner will be on your own tonight. Overnight in Paris. Our final day of pilgrimage will take us to visit the Louvre Museum. You will then have the rest of the afternoon at leisure to enjoy the sights and sounds of Paris. We gather tonight for a French cuisine farewell dinner. Overnight in Paris. 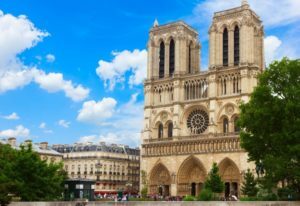 This morning we make our way to the airport in Paris for our flight home, taking with us wonderful and inspiring memories of our pilgrimage, which will be treasured and relived for the rest of our lives.